Last year I started making what I refer to as my “Tree” quilts. They have a touch of realism to them which seems to attract buyers. In addition to the sunset quilts, these are my best sellers o f a particular design. Since every quilt is unique and I don’t use patterns, I continue to experiment with new designs. This month I just finished three TREE quilts which are all very different than the past quilts I’ve made. The first one is more abstract than before due to a different piecing approach for the background. These tree quilts are all pieced which means there is a careful sequence of piecing that involves making a background section then cutting it up to insert one or two trees, adding more foreground, more cutting to insert more trees, etc. This background is a more random piecing of non square squares and rectangles. 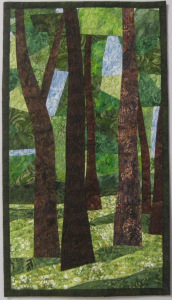 The quilt itself is also more oblong and vertical in its final size with just a few larger trees instead of the deeper perspective of previous quilts. The foreground around the base of the trees was also changed to be a composition of only two or three fabrics. 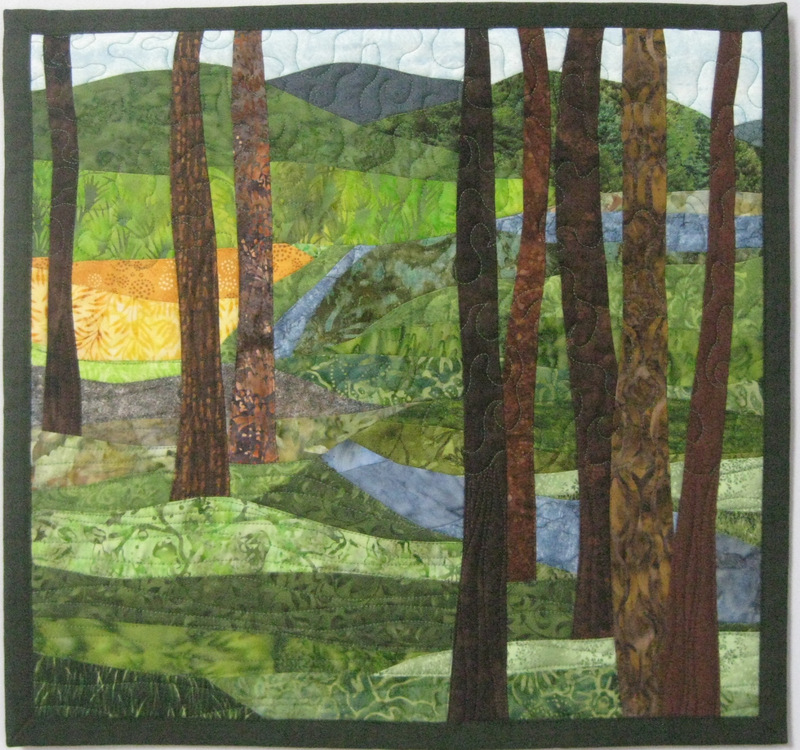 The next TREE quilt I just finished used a very long distant landscape as its background and I inserted just a few trees in the foreground of the quilt. 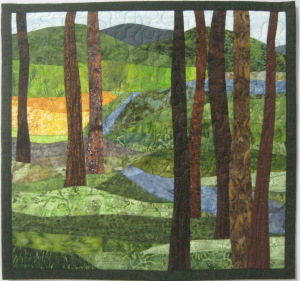 This quilt includes our rolling hills of central Pennsylvania along with wheat fields, a stream, and the many greens that we see in our spring and summer panoramas. Finally, I went in a different direction, still exploring a limited number of foreground trees. I set this quilt in by a lake on a bright day with vibrant blues in the sky and lake with just a few large trees in the foreground. 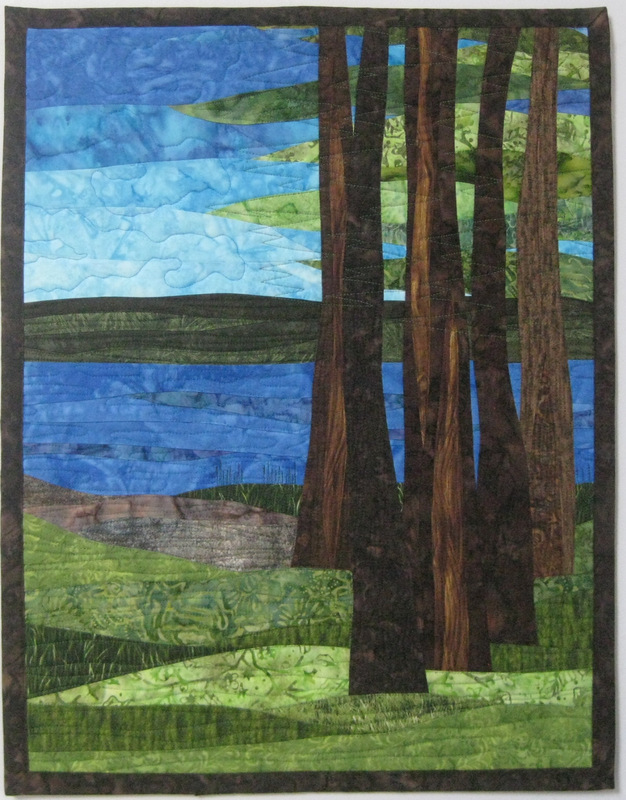 I used my usual strip piecing for the background but used greens for part and blues for part to convey the leaves of the trees against the blue sky. 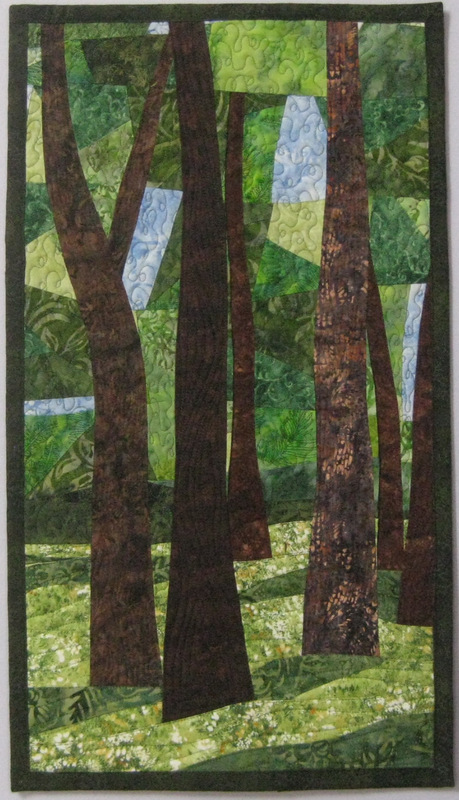 I enjoy exploring new ways to create quilts with a motif like TREES. I’m not so good at redoing the same designs though I’m always happy to make a similar quilt to one of my designs as a custom quilt in a larger or smaller size.